Joining the recent food truck trend is The Big Gay Ice Cream Truck. I absolutely adore Doug Quint, the truck’s owner, and creative force. A classically trained musician, Doug started his ice cream business earlier this summer and has quickly obtained a following for his quirky former-Mr. Softee truck. The soft-serve vanilla and chocolate served is nothing unusual. It’s the toppings that make Quint’s business so different. The toppings menu changes daily but there are always both sweet and savory choices like crushed Nilla Wafers, blueberries, pretzels and dulce de leche. I encourage you to be adventurous and sample some of the more unusual offerings that pair beautifully with the ice creams. My favorites? bacon, cayenne, and olive oil and sea salt. For a non-cone indulgence, BGICT also serves huge Nutella ice cream sandwiches with soft-serve and a layer of Nutella goodness sandwiched between two chocolate cookies. Whatever you do, don’t bite into the two cookies, together. They’re sure to collapse, as Doug is quick to advise. For more information about the truck’s daily whereabouts and schedule, you’ll need to read their blog and follow them on Twitter. The truck is usually parked in the Union Square area… but not every day. The Nutella ice cream sandwiches sound amazing! They are! It's a real art to eat them -- you really can't put the whole thing into your mouth the way you would with an ordinary ice cream sandwich. Plus, you wouldn't be able to savor the flavor combination that way either. 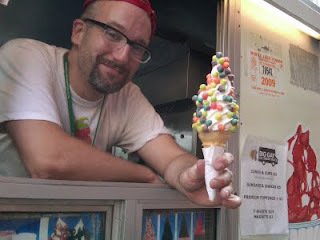 I always hear the buzz about the big gay ice cream truck.. That is one delicious ice cream topping!